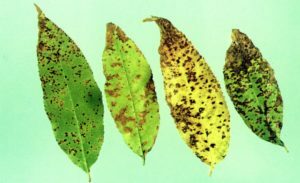 There are two main types of leaf disease that can cause the spots that you see, which are ones caused by bacteria and ones caused by fungus. 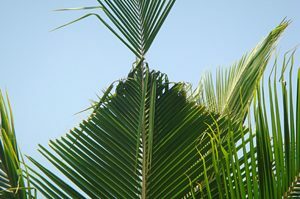 Leaf spotting caused by either tend to have the same types of symptoms and appearance. Both of these types of leaf disease occur the most frequently in warm, moist environments. These conditions are conducive to the bacteria or fungus landing on the leaves and eventually spreading. For example, if its rains heavily and the ground has some of the bacteria on it, it can splash this bacteria onto part of the tree or plant. The main symptoms of leaf spots are the appearance of brown or black spots on the actual leaf. In most cases, these spots will grow over time and can even combine with other spots if there’s moisture on the leaf. If the weather becomes dry, the spots will appear speckled. The leaf spots usually become yellow or have a yellow halo on them. It can eventually affect most of the foliage on the tree and can be present on the branches, twigs, and so forth, making the tree both extremely sick and unpleasant to the eye. There are some preventive measures that can be taken in order to prevent leaf disease. The first is to make sure that the soil underneath and immediately surrounding the tree is kept clean. You should make sure that any fruit or leaves that fall off the tree are cleaned up. Second, make sure to use a liberal amount of mulch on the soil once it has been cleaned and raked. This is useful in helping to prevent the bacteria or fungus from spreading onto the tree. Third, make sure to regularly prune your trees and also to use a disinfectant on the equipment that you use to do so. If the leaves on your tree are infected, one treatment method is to spray a baking soda solution onto the leaves. It should consist of 1 tablespoon of baking soda, 2 1/2 tablespoons of vegetable oil, and 1 teaspoon of liquid soap for every 1 gallon of water. Make sure to test out the solution on an individual plant leaf first before continuing. A second treatment option is to buy a fungicide specifically for this issue. This is probably the most sensible solution for most people. Be sure to read the label to make sure that it’s designed for your type of tree. Lewis Tree Service has close to 30 years of experience in fighting leaf disease, so if you suspect that your tree is infected, we can have one of our ISA certified arborists come to your property to examine it. Contact us today for a free quote!